Joyful Socks Mom: Frugal Living: Natural Play on a Dime! As promised, we have completed filling the Bug's Natural Play area with fun and engaging toys that will keep her time filled with imaginative play and education. Now, that might sound like a tall order, but it was much simpler than you would think. I did not spend hours crafting. I did not spend hundreds of dollars (you guys know me better than that, don't you?) What I did do, was look at the resources we had on hand. I took some time at thrift shops and yard sales to look for a few odds and ends. We used my husband and his handy-dandy shop to fill a few requests from the Bug. We set some ground rules for her new Natural Play area, and there you go. I ended up only purchasing only a few separate items for her play area. Total for the entire revamping of the Bug's toys? $12 Total! Natural Play without breaking the bank or breaking Mommy's back! Tea Time basket - This is actually an older set that has been up on the shelf. Since moving to the Natural Play area it has seen far more action. We use this together at least two times each week for "Mommy and Me" teatime. Seaside basket - I spent a little extra funds on this basket. I purchase a bag of nice shells at Big Lots for $6.00, adding to them with various shells we collected last summer at Galveston beach. Forest basket - I purchased some nice smooth rocks at the Dollar Tree . . . you guessed it, $1.00. I had some feathers, pin cones (from the local park), some paper and fabric flowers already on hand from my craft supply cabinet. The felt owl was a gift from Mr. Fix-It, one of my Co-op students. This is a partial shot of the Bug's exclusive Natural Play space. It is actually a space that is part of our homeschool area in the living room. Food and Kitchen basket - This basket features a few items we already had around the house. I would really like to add some wooden and felted foods to this basket, but that is for another time. The Bug had a wooden pedestal and mortar which is perfect for mimicking kitchen action. I gave her a salt shaker (full of salt but with a cotton ball stopper) left over from a sensory bucket we did in the Fall. Then a few simple fun things like: a plastic apple, chopsticks, cinnamon sticks, small "mixing" basket and wooden sticks for mixing. Play "Silks" basket - Okay, this is where we did a bit of skimping. I am not going to spend a ton of money on genuine play silks, there, I said it and it's out there. Instead, we just went through Mommy and Great-Grandma's wide selection of handkerchiefs, bandannas, scarfs and head-coverings. The Bug picked her favorites and we piled into a basket for her. Done. I like my way better than the more expensive play silk method, just saying. Gnomes from the Bug's Woodland play basket. We made these little cuties out of salt dough. We used yarn and felt for hats. We are currently working on dresses for for the little "gnome" sisters. The big kids have been reading the Hobbit out loud. I think she has been inspired to create many "shire" like play scenes using these as her hobbits. This is a little inspiration display that we created together. It sits just above her play area. The old photo is a picture of her daddy when he was a little boy with her grandfather (his daddy). Wood baskets: The Bug has several different wood block baskets. Hey, her dad is a carpenter so this is an area of plenty! He cut the round blocks out of natural wood and left the bark. I don't know how he hollowed the wood, but she LOVES to use this in play. I've seen it become a bird house, a gnome home, Bilbo Baggin's home, a casserole dish, a secret hiding place . . . and the list goes on. Wood figures from her Woodland play basket. Woodland play basket: This is the basket that holds the hodgepodge of her woodland characters. This selection of woodland play came from all over. The figures were gifts from friends over the years. They are old ornaments that I took the hooks off of and re-purposed them as woodland angels. The little decorated drift wood was given to her by our neighbors, who are surrogate grandparents. The wife used to craft these little items. She gave a finished one to the Bug and she also inherited all the craft goodies that went into making these. Nice! 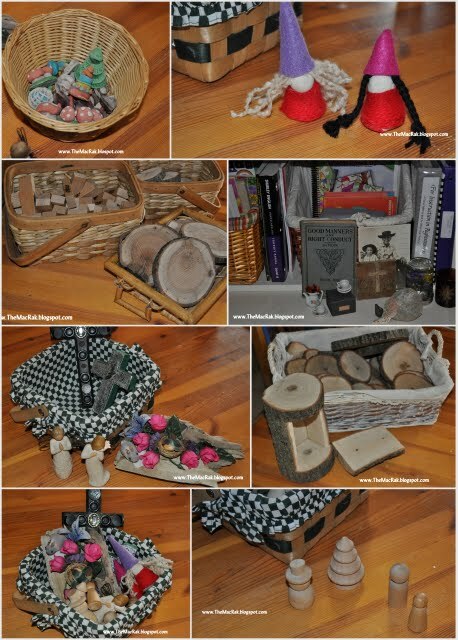 More Wood play baskets: Here are more blocks. Yes, there is a basket full of old Jenga blocks that I got at a yard sale for $0.75. They work great for all the many things she needs to build. She doesn't seem to mind that they say Jenga on the side either. 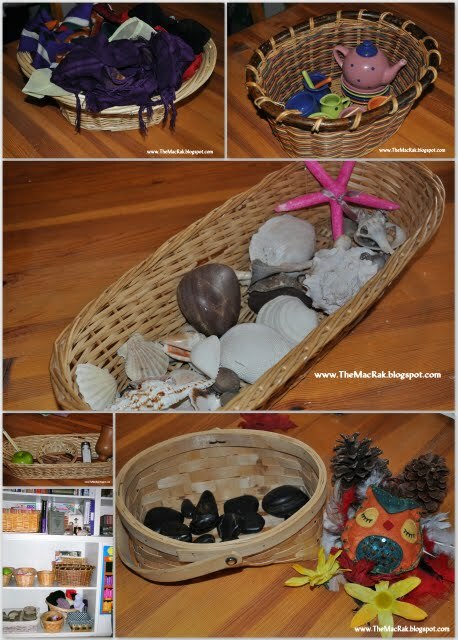 Accessory basket: This is where the Bug stores all the Salt Dough goodies that we made for her. Plates, flatware, food, trees, toadstools, etc. This only took an evening of family fun to create and everyone had fun chipping in. Cost? The salt, water, oil and flour that we already had on-hand. So, there you have it. Not exactly organic, but as natural as we are going to get on a tight-budget. It has made for one happy little girl, which is part of the point!